With a parliamentary inquiry into the collapse of Carillion underway, Britain’s four biggest accountancy firms are facing new scrutiny. All of the Big 4 apparently failed to detect a near £1 billion overvaluation of assets in the company. The UK’s Financial Reporting Council (FRC) is calling for the competition regulator to investigate audit failings leading up to Carillion’s collapse. One of the biggest issues the Carillion story has exposed is the varied quality of independent oversight in the business. The FRC investigation will look at the ethical and technical standards of the auditors involved. Their independence and integrity will be under the spotlight like never before. The FRC’s Chief Executive, Stephen Haddrill, has told MPs there needs to be more competition in the major accounting and audit markets. Unfortunately, independence – or the lack thereof – is a contentious issue already debated but with little resulting action. Back in 2013, the Big 4 were heavily criticised for their close personal relationships with chief executives. Nothing was done. Taking lessons from the Carillion example, and the countless before it, is vital for all growing businesses. Whilst the FRC’s investigations will take many months, there are crucial, simple steps businesses can take now to safeguard the quality of their own audits. A key to delivering quality auditing and accountancy services is understanding the business model whilst remaining independent. This independence is characterised by integrity and objectivity when assessing clients’ businesses and accounts. Auditors must carry out their work fearlessly, freely, without bias and without vested interests in the audit’s outcome so that the reports they produce are accurate and correctly evidenced. To be truly independent, an auditor must achieve something experts call ‘independence of mind’. This means that the auditor can make unilateral decisions and does not find itself facing conflicts of interest that impact upon financial reporting. Pressures from senior executives, as well as the auditor’s internal pressures to upsell additional services, and the emotional pull of interpersonal relationships are all factors that can impact on true auditor independence. Can independence ever really be assured? The short answer is no. But there are several steps that business leaders can take to ensure greater independence as their corporate governance framework develops. Understand that an external auditor makes their living from the fee that you pay them. Naturally, this creates pressure to work in a way that will not jeopardise engagement. Whether subconsciously or not, this can potentially impact upon the independence of the audit’s outcome. Many studies have found that the larger the fee, the more likely an auditor is to fluff their role and produce an audit that panders to their client, rather than giving them the advice they need. To avoid manipulation of figures, usually inadvertent or subconscious, auditors need to be protected from the Board of Directors in a way which allows them to challenge statements without fear of recrimination. Brief your Board and check egos at the door, if you want independent results. Very often audits start without understanding the client business model: a quick, tick-box exercise does not work. External auditors must have a purpose and the required knowledge of the processes they are auditing. It is very well checking historical information, but projections going forward with a comprehensive business plan provide valuable information. Make sure your auditors have transparent access to this in order to provide the most objective review possible. Often audit firms are large organisations that provide multiple services to one client. Tax advice, ICT consultancy and even marketing communications support are some of the additional services offered by the Big 4. Adding substantial non-audit fees into your professional relationship can seriously impact upon auditor independence. Reduce the auditor’s dependence on you, and preserve their independence, by shopping around for other suppliers. Finding an external firm that you like can sometimes be a challenge, but it is important to rotate audit contracts so that personal relationships do not hamper auditor independence. By keeping the same audit firm year after year, it is nearly impossible for external auditors to not become conflicted between reporting financial vulnerabilities or failings and the need to maintain relations and contracts. Instead, when an auditor knows that their contract is to be replaced, they become inclined to produce work of an extremely high and independent quality, to avoid the embarrassment of the incoming audit team exposing their errors. Currently the United States is leading the way in ensuring auditor independence. There is a legal requirement on businesses to review audit control procedures every three years, ensuring that external audits are carried out professionally and independently. No such system has been formally implemented in the UK. The Carillion story may see tides turning in the near future. Businesses must ensure they are being provided with the highest quality audit reports. Follow the steps above to avoid the same fate as Carillion. Your reports will be of higher quality and you will secure the future of your business. 3E Accounting Pte. Ltd. stands out as one of the leading service providers, especially in Singapore Companies Registration and Corporate Secretarial Services, with its one-stop solution that covers all of its client’s accounting and regulatory requirements. We spoke to Managing Director, Lawrence Chai, to gain an insight into the firm’s impressive success. Throughout Singapore, many people are looking for a reliable services provider who can fulfil their accounting, taxation, secretarial, immigration, human resources, payroll, legal, marketing and other compliance need. Located in Novena, 3E Accounting makes the cut as one of the leaders in these cost-effective professional solutions for startups and small- to medium-sized firms with their principle: efficiency, effectiveness and economy. The professional team at 3E Accounting, which comprises highly experienced and expert professionals in Singapore’s financial, tax, corporate and regulatory milieu, is one of the important reasons that factorised the success of the company. 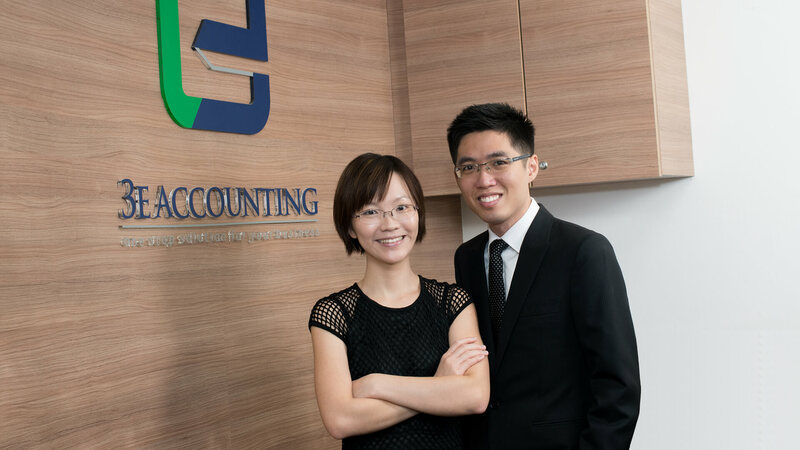 The husband and wife team, who are also the founders of 3E Accounting, Lawrence Chai and Stephanie Chua are the driving force behind the continuous success that 3E Accounting achieves. Before starting up 3E Accounting, the pair worked for an audit firm where work-life balance was not an important part of the workplace culture. When they were expecting their first child in 2011, the thought of having more family time prompted them to start their accounting firm. Another key factor was that they both noticed the discrepancy in services at some other firms in Singapore. Many accounting companies are offering overpriced financial services which not many people can afford. Drawing on their combined years of experience in the industry, both Lawrence and Stephanie were confident that they could start an accounting firm that offers financial services at affordable price. “As of now, we are proud to say that 3E Accounting is currently one of the leading service providers in Singapore that supports entrepreneurs to start their business with our one-stop solutions.” said Lawrence. Having built the company from scratch, Lawrence clearly has a goal in mind and he outlines the vision of the firm, detailing what techniques will be used in order for staff to hit their targets and achieve the overall mission, something he is clearly excited about. 3E Accounting is not just a normal accounting firm, but a one-stop solution provider that offers all the services under one roof. The diversity in services shows that 3E Accounting is truly the one-stop solution services provider in Singapore. In addition to this, expanding the geographic footprint of the business to the whole world has always been one of its core goal. 3E Accounting expanded into Malaysia in 2014, and it is currently the leading services provider in Malaysia. In 2016, 3E Accounting started its own international accounting network: 3E Accounting International network, which is managed by 3E Accounting International. It’s expanding and growing fast with 54 countries, 86 offices and 1,300 staff worldwide today. The “Best Home-grown Global Accounting Network” award was the important milestone as it endorsed the reputation of the international network. Lawrence goes into a bit more detail about the accounting network. Capitalising on its global success, 3E Accounting has also garnered a reputation for being a tech savvy accounting firm. It has also recently become the first accounting firm to implement the revolutionary double robotic technology. The adaptation of the emerging robotics technology in the workplace provides a flexible working environment for staff. Besides, this technology also enables the firm’s valuable workers to contribute and communicate with other team members, regardless of the geographical barriers. Moreover, 3E Accounting is well aware of the urgency of employing software or online tools in today’s business world, and Lawrence and Stephanie understand how this can benefit all companies in the long run. Therefore, specialists in 3E Accounting will take the initiative to introduce suitable software or tool that suits their customer’s business. In relation to this, 3E Accounting is now a Xero Certified Advisor, providing Xero Cloud Accounting Software in Singapore on valuable business and tax advice that assists our client’s in setting up Xero software. Furthermore, 3E Accounting is also a QuickBooks ProAdvisors that provides QuickBooks Online Services in Singapore to our clients, as well as deep product knowledge and a stellar client service. the opportunity to work on the hardest problems and that’s where we build our firm around that belief.” The large pool of professionals in 3E Accounting is one of the notable reasons that the firm outperforms its peers. There is a right mix and number of accredited and experienced professionals in the team, such as a registered qualified accountant, qualified secretaries, a qualified tax agent and a qualified GST agent, along with a qualified HR personnel, and lastly a qualified immigration consultant. Besides, they have a strong network with professionals and specialists from different fields, who they can refer their client to for help, that consists of good lawyers, bankers, fintech companies, auditors, software vendors, property agents, insurance agents and many more. The strong network and resources are a kind of assurance to clients that they can get any required assistance when they come to 3E Accounting. 3E Accounting put client interests ahead of the firm’s. To ensure that clients are able to have an input into the firm’s operations, 3E Accounting uses its complaints system as a customer whistleblowing charter, because the firm believes that customers’ views count and should be acted upon. Their almost 100% customer satisfaction score vouches their reputation. Every complaint is personally handled by Lawrence and is taken with incredibly seriousness, and dealt with the utmost urgency. The team are committed to responding to clients within 24 hours, and the management are always monitoring the system to ensure all staff adhere to the principle. As a leading player in the finance industry, Lawrence gives us his views on the state of the industry at present, and explains what major challenges the company and the industry face. He then goes on to describe how 3E Accounting stays ahead of emerging developments within the industry. “Fundamentally, the major challenge that we are facing now is the adaptation of technology by accounting firms and how to transform the business to be future-ready. For 3E Accounting, we incorporate technology into our workplace and stay updated on all new developments. We adopt technology and get ourselves ready for the future, as we have migrated most of our services to the cloud as well as a hybrid IT environment with physical servers and cloud based servers. “We have strong banking relationships with our banking counterpart – OCBC Bank. 3E Accounting has been recognised as an OCBC Platinum Partner in 2017 in Malaysia. This is not an ordinary recognition and we are one of the few companies to get it,” Internally, it is vital that all of Lawrence’s employees are working towards the same mission and heading the same direction. “Another thing worth mentioning is we have a low staff turnover rate and high staff retention rate. We do not find it difficult to get talent and we can attract talent to join us easily. Furthermore, we focus on staff professional growth. We provide opportunities and chances to our staff to grow and learn. For example, we trained our administration staff to become immigration consultant, human resource personnel as well as compliance officers. We focus on the capability and experiences rather than just certificate itself.” On 28 November 2016, the team was honoured to have the Senior Minister of State, Mrs Josephine Teo, to visit its headquarter office in Singapore. During the visit, Mrs Teo got to know the good employment practices that have been adopted by 3E Accounting, as well as the technology that the firm has used to enhance work productivity. This aspired the firm to continue to cultivate the work life balance culture. 3E Accounting’s efforts pay off with awards and recognitions. On 1 November 2017, 3E Accounting PLT and 3E Accounting Pte. Ltd were both honoured to be awarded separately, the Best Company Registration Specialist of the Year 2017/2018 in Malaysia and Singapore respectively. 3E Accounting was also listed as the Top 30 Accounting Firms in Singapore, as well as being featured in Singapore Business Review’s Magazine for January 2016 issue. This global growth, together with awards and recognition from some of the world’s leading industry experts, highlights 3E Accounting’s ongoing prosperity. Statistics from the Office of National Statistics, released this February, have shown what many experts in the property sector had been discussing for some time. With prime central London districts in desperate need of further housing, investments into this area would seemingly be a ‘no-brainer’. A large influx of property developers should be praised however it seems that their market positioning hasn’t left them in as good stead as they would have previously hoped. It seems that many of the developers lost sight of their main audience for the projects and have left themselves in a precarious situation.in need of housing, but this housing has been developed at a price point far above the limit of those who in need of it. As planning applications frequently go to the highest bidder who has large-scale profits ahead of the need to provide ample housing. Potential doubt over the impact that a lack of impetus from foreign investors will have across the sector, has been the topic of much speculation. With findings published by Land Registry supporting the idea that foreign investors are “shying away from the capitals market”. The figures show a 55% decrease in the number of high-end new build homes sold in London’s most select areas. In fresh statistics (February 2018) paint a good picture of the UK market, where over the course of 2017 house prices rose by 13.7%, increasing the average UK House price to £258,580. The largest increases were found in Cambridge and the Orkney Islands at 15.7% and 18.2% respectively. These figures do not spread down into the South East where the housing market is traditionally most prosperous. This downturn in sales has affected all parts of high-end London housing as a report by Mayfair agents demonstrates. There is a recurring pattern of exclusive housing with no residents. This couldn’t be seen in a more exaggerated fashion than when looking at The Shard, this famous building remains in the headlines for its incredible architecture, however, the infamous apartments at the top of The Shard remain unsold almost 5 years after they were initially put on the market. This is at a considerable cost of over £50m. This isn’t a unique situation, as in London alone, almost 2,000 apartments valued over £750,000 remain unsold over a year since their initial entrance into the market. 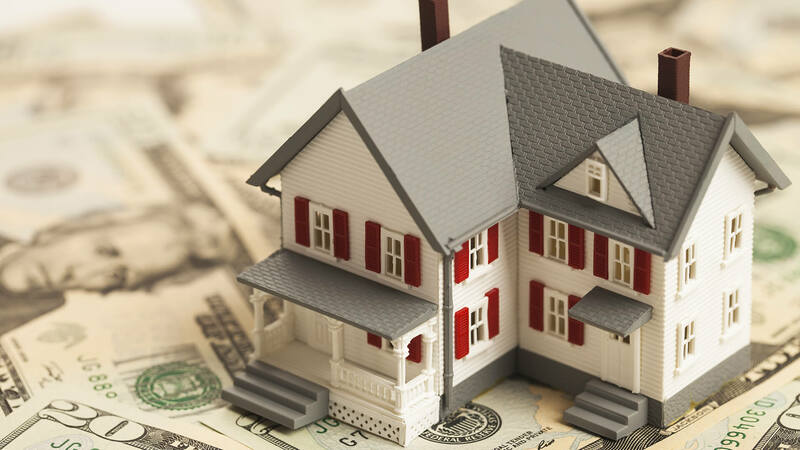 As Land Registry figures show that since the financial crash of 2008, property values have stuttered in their ability to regain the peak they hit prior to 2008. Over 10 years have passed since this peak and relatively poor performance can be seen when filtering the results by months with the highest rate of completed property sales, from 1995 onwards, there is only one single month post 2008 that features in the top 100. Click the image below to read this months issue! 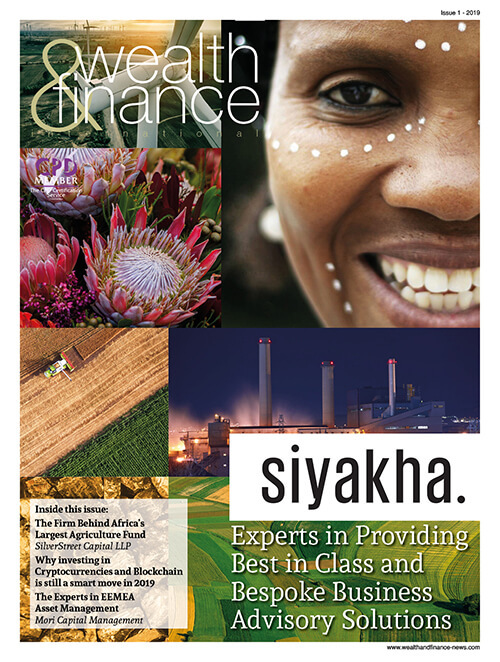 Welcome to the 2nd edition of Wealth & Finance Magazine, your source for the latest industry news across both traditional and alternative investment sectors. 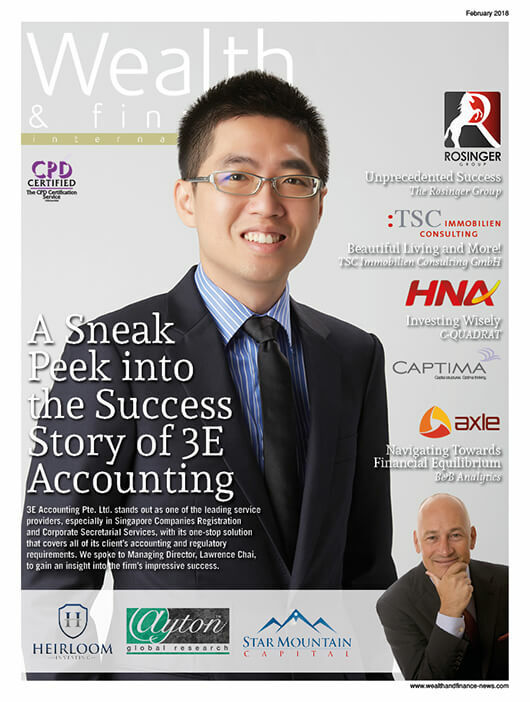 Gracing the cover of this month’s edition, is 3E Accounting Pte. Ltd. The company stands out as being one of the leading service providers, especially in Singapore Companies Registration and Corporate Secretarial Services, with its one-stop solution that covers all of its client’s accounting and regulatory requirements. Taking time to discuss with us the firm’s impressive success, is Managing Director, Lawrence Chai who reveals more about the professional team at 3E Accounting, which comprises highly experienced and expert professionals in Singapore’s financial, tax, corporate and regulatory landscape. Elsewhere in this edition, we learn more about international asset manager, C-QUADRAT who seeks to realise continuous and sustainable growth for its investors. Recently, we profiled the firm and HNA Group, which has recently invested in the company, as we explore what this means for both sides going forwards. Lastly, since its inception in 2012, B&B Analytics has equipped clients with a complete and proven operating model, enabling them to deliver enhanced transparency, safety and sustainable performance. When speaking to Guido Buehler, we began our quest to find out more about the extensive success of the company. Here at Wealth & Finance, we truly hope that you thoroughly enjoy reading this issue, and we look forward to hearing from you. What are the main tax concerns for businesses looking to set up a branch abroad? 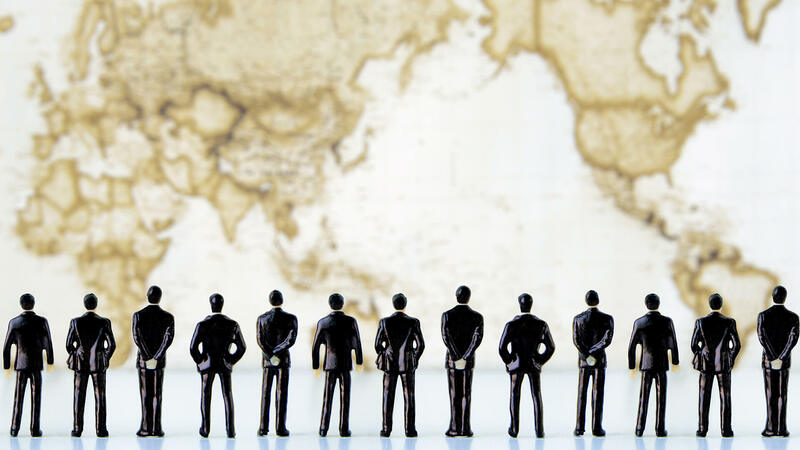 The hundreds of different nations across the globe – all with different laws and different tax rules – offer businesses an exciting platform to expand their trade. Financial advisers can look how to best advise their business clients on how to minimise their tax bill, using their knowledge and expertise to identify the best opportunities across the world. Expanding abroad is very expensive as it is but you can save money through an understanding of the tax system. Challenging economic times mean that companies are looking to save money where they can and reduce their tax payments to stay competitive – especially if they feel that they are paying more tax than is fair. Tax jurisdictions which are struggling economically deliberately cut their corporate tax rate with the pressure to compete and attract more business. Britain is known to be exceptionally ‘high tax’, so it makes financial sense for businesses to look for alternatives-even if they do sometimes go too far! While companies may look to pay less VAT, they contribute vast amounts to the UK economy in other ways – but they need to stay competitive in order to do so. A huge amount of tax comes from UK businesses, but only a small amount of that is corporation tax. Therefore in its current form, corporate tax is perishing, because a product is no longer made in just one country. It is universally acknowledged that companies can minimise their tax bills by setting up branches abroad. For example, Google UK operates in Ireland and Bermuda, taking advantage of the low tax rates and state that they have a responsibility to their shareholders to minimise costs. Google deliberately chose Ireland as its nucleus to coordinate marketing and sales across Europe. When a business chooses where to locate its distribution and service hubs, headquarters and factories, it makes financial sense to choose a low-tax jurisdiction. Obviously tax is just one of the criteria when a business is looking to set up a branch abroad – they also have to locate near local suppliers and an expert workforce. It is extremely doubtful that a universal corporate tax law will be implemented across Europe in response to this movement, as this would mean that countries such as Ireland would lose out, no longer able to offer a cheap rate to cut the amount companies must pay on profit thereby no longer attracting business when they desperately need to. Cash-needy governments are looking to crack down on businesses saving tax abroad, but even if a company can’t set up a branch abroad it can still move its taxable profits overseas. For example, the UK part of the business lending money to other branches abroad – this is known as ‘transfer pricing’. Intercompany transactions are of course perfectly legal. With the knowledge that taxes vary from country to country, the first step is to maximise tax efficiency by finding out what tax you are required to pay in which country. Planning your move is crucial – your financial advisor will need to look into whether you need to create a permanent establishment abroad and whether it will benefit your business better as a branch or a subsidiary. Other factors to negotiate or consider include whether you should recruit staff locally, or bring UK staff (UK tax resident or overseas residency) and how that will impact tax you pay. You will need to register for local tax and take into account your foreign currency, banking obligations and repatriation of profits. Businesses can apply for a lower corporation tax rate for profits made by patented inventions. There are many key benefits for a business in setting up a branch abroad, including tax savings that can be found in the government incentives of the country you choose to move to. Differing countries are sure to want to attract your business and a branch abroad offers access to a potentially untapped market, an increase in global brand identity and better business recognition and support in a more encouraging environment. Seeking expert tax advice will allow you to watch out for the pitfalls and take advantage of the opportunity to expand and grow your business. January is an important month in the investment calendar – this year more than most. After a bullish 2017, where most risk asset classes made consistent, if not impressive gains, many feared this long bull run would come to a shuddering halt. However, a month in to 2018 and with a round of solid economic data coming out, the mood of market participants has become increasingly optimistic. But should they be? It is undeniable that after the tumult of 2016, 2017 saw markets perform exceptionally well, despite a tense geopolitical backdrop. Take major indices as an example. 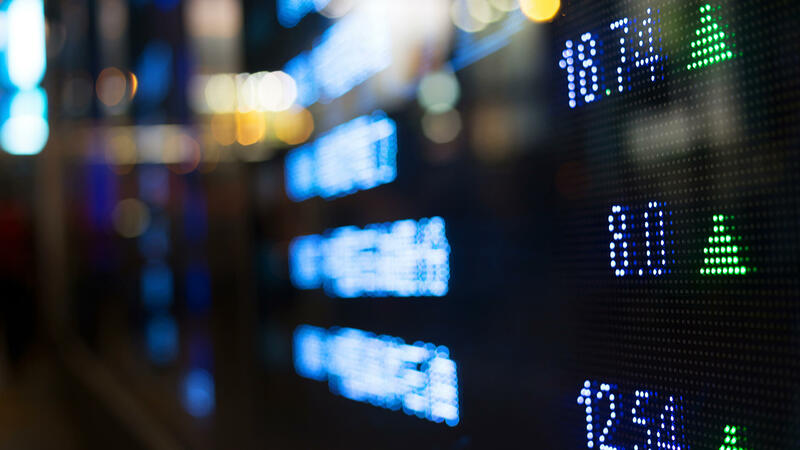 Over the course of the 2017 calendar year the FTSE100 was up 7.6%, the FTSE250 was up 14.65%, the Dow Jones closed 25% higher and the NASDAQ climbed 28%. 2018, however, will be more difficult. The aftermath of the financial crisis and the monetary policies pursued by central banks in the form of quantitative easing has led to stretched valuations across the board. The impact of an increased money supply has even trickled down in to the valuations of newer, less tangible asset classes like cryptocurrencies. In 2017, the S&P saw 12% earnings growth against a backdrop of a 20% price rise. In other words, share prices are rising faster than earnings and this year there are similar expectations and extrapolations in terms of earnings growth across most major markets. However, with high expectations and high valuations, danger is never far away. Global economic growth will generate some momentum, alongside the tax reforms in the US. With most major economies growing simultaneously, there may well be an accretive effect which feeds through in to global GDP growth. However, we are at a late point in investment market and economic cycles respectively. At London & Capital we are advising clients to proceed with caution and to remember the importance of protecting capital especially when the market environment is driven by greed. Part of the reason for caution is the prospect of further monetary policy tightening. At the very least there will be a series of interest rate hikes in the US with the prospects of a reduction in monetary stimulus in Europe and even in Japan. However, it is the UK that represents the best example of the pitfalls from the interest rate cycle. The Bank of England Monetary Policy Committee’s recent hawkish rhetoric may potentially lead to a trigger for a downturn from the interest rate cycle. The uncertainty around Brexit and the stretched British consumer means that rate hikes in the UK would be a blunt instrument in dealing with temporary cost inflation from a currency devaluation which has now passed. Additionally, with the UK consumer having taken on significant levels of personal debt since the financial crisis, interest rate rises at this stage may hamper the spending of Britons further still and create a bust in consumption from a classic rate cycle trigger. It is on the subject of debt that we need to talk about another significant economic player: China. China’s debt risk is considerable. Its debt to GDP ratio has surpassed 200% as the Chinese economy has pivoted from being production and export-led, to being consumption based. The 200% threshold represents a watershed moment. This is the point at which in the past countries from Japan, Spain and the Tiger economies of the Far East in the late 90s reached before they slowed significantly and endured economic discomfort. China will likely be unable to continue growing at the 6% clip it has in the recent past given this debt level. 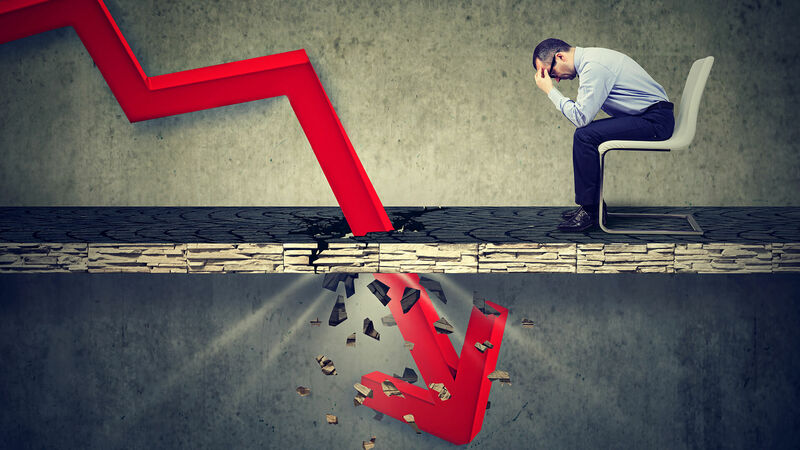 As the world’s second largest economy, even a relatively small drop in the rate of growth could have significant consequences – not just for manufacturers, industrials and those who have seen China as the world’s workshop. It will also have an impact on retailers keen to target an increasingly wealthy Chinese consumer. Commodity prices could also be affected. China’s demographics are also changing quickly. With the effects of the one-child policy promoted by the Chinese Communist Party in the latter part of the 20th Century becoming more apparent, China’s population is peaking, meaning a supersize generation of retirees may need to be supported by a smaller, younger cohort. This again could constrain disposable income with all the consequences that brings to business. As such, it may well be that the Middle Kingdom grows old before it grows rich. There are plenty of warning signs which should make investors cautious about the investment landscape in 2018. This year, the old investment adage that past performance is not a reliable indicator of future results has never been truer. Roger Jones is Head of Equities at London & Capital. London & Capital is an independent wealth and asset manager. This article has been prepared for informational purposes only, and is not intended to provide, and should not be relied on for investment advice. Always seek appropriate professional advice.